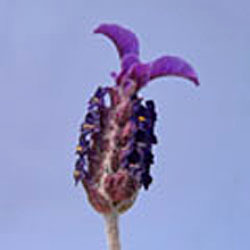 This Spanish lavender cultivar has dark purple side corollas .The short showy top bracts are bright reddish purple. Top bracts are ruffled and a bit curly. Categories: all potted plants, deer resistant, fragrant plants, lavender plants, Potted Plants, More..